Version 1.2.2 makes it easier to select routes by adding a route description on the routes screen. More BusTime agencies can be added; read more below. Jata development consumes time and money. Yes, actual money because now there is a web server involved to support jata. Please donate to enable continued jata development and server fees. Routes->Stops->Predictions. And, you get where you wanted to be, at predictions. 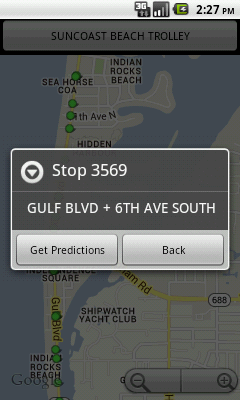 To get there faster, save a stop as a favorite. You can save a route or a stop as a favorite with a “long click” on the item in the list. Normal flow is to advance to the next view. Add a favorite stop with long press. 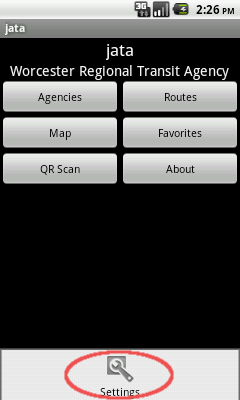 Jata can display the stops for any selected route on a map. 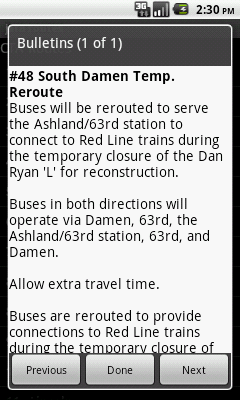 This can be handy when you are in unfamiliar territory, and need to find a stop. Tap on a stop icon to get the predictions for that stop. Barcode Scanner interprets the sign. Jata asks you to choose how to open the scan result. 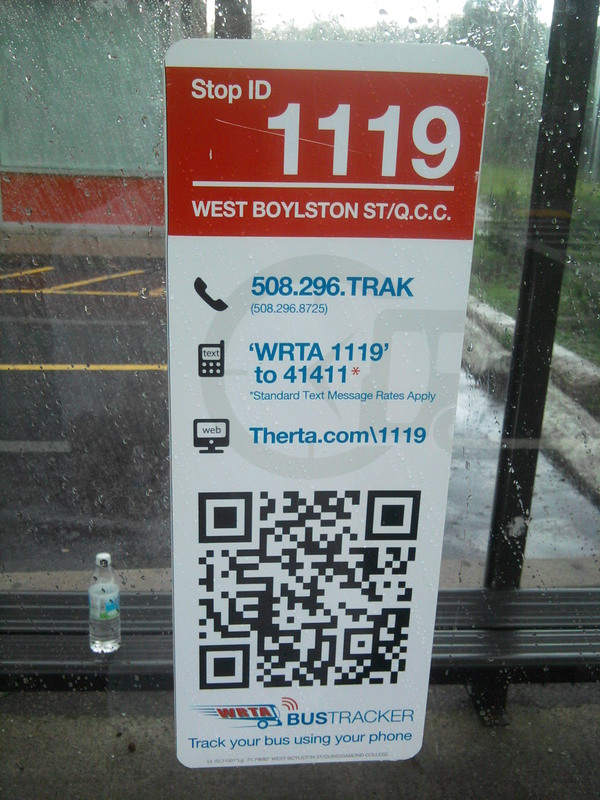 Some agencies (WRTA for one) post QR code signs at stops. The code is a link to the BusTime web site, where you can see the predictions for that stop. 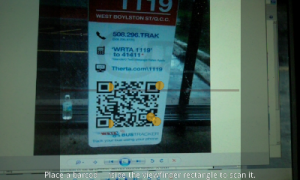 A Barcode Scanner app will offer to open a browser to view the site. Jata can integrate with an optional scanner. The QR Scan button will open up the ZXing Barcode Scanner, if installed. If it’s not installed, you will get a dialog asking if you would like to install it. Once the scanner opens up and recognizes the code, jata will ask if you want to see the link in a browser, or try to display the predictions in jata. You can select the default action or disable the Scanner button completely in Settings. Side note: I recommend not to open the WRTA barcode results in a browser, as you could miss the bus waiting for the web page to open! Jata is much quicker. Also, if it happens that there is no network connection, the browser might happily display the cached copy left over from last week rather than alert you there is no connection. 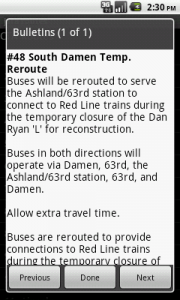 On the Routes or Stops screens, press and hold (Long Press) an item to Add/Edit Favorite, See on map, or check for Service Bulletins. 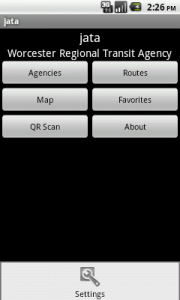 If you select Check for Bulletins from a long press menu, jata will request service bulletins for that map or stop. This is an example from CTA. Settings (more than you want, or should need to know). Access the Settings screen by pressing the menu key on your device or from the Action Bar if your Android device is Android 3.0 or higher and has no menu button. 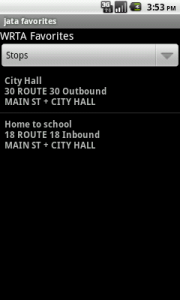 I have to assume that Android 3.0 phones have a way to display the Action Bar without building an action bar into jata. The settings screen is not very pretty. You should be able to stay away from it most of the time. Here you can ask jata to “phone home” and look for an updated agency list. Jata is able to work with any agency that uses Clever Devices BusTracker and will will distribute a “key” to an application developer. If you know an agency that you want added to jata, comment on this post, or email jata. Stillwater will try to keep this page and the online database current for any new agencies added. 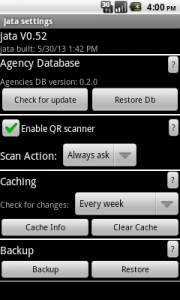 You can enable the QR Scanner button, and select a default action for scan results, or disable the scan button entirely. The default action lets you elect to open the result in Jata (only tested with Worcester’s transitmob signs), or just open in browser. 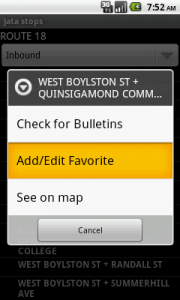 If there are no QR coded Bustop signs, as there are in Worcester, you can disable the button. Or, you can leave it enabled, and if the default action is set to Open in browser, you can use it as a handy product code scanner for items at the bus stop news stand while keeping track of the bus. Jata stores all “static” data in it’s own database, which it creates and updates every time it looks up a new route list or stop list. It does this to speed things up, and to conserve data bandwidth that you, the user, might be paying for. Routes and stops are “static” items, for some definition of static . They can change at any time, and jata cannot predict when they may change, so it is left up to the user to choose how often to check. Hence, the Check for changes item, allowing you to choose to check every day, or other periods up to monthly. The Next access choice allows you to force jata to re-check it’s cached data the next time it is needed, and is provided in case you learned through a Service Bulletin or other means that routes or stops may have changed. Cache Info will display the storage required for all the cached items, helping you determine whether to Clear Cache. You may want to Clear Cache if you are running short on storage (jata has been known to work OK after moving to SD card from Android’s Settings->Applications->Manage Applications->jata->Move to SD card button). Another reason would be if jata displays a message like “the parameter is incorrect”. See the footnote in Caching. Backup and Restore allow you to copy cached data and favorites to and from an accessible location on external storage (SD card is assumed). This could be used if you get a new device, or need to uninstall or reinstall hata. Backup copies all cached data files without asking for confirmation and the results are displayed. Restore allows you to choose what files to restore from the backup location. The backup location is on external storage under jata. Example /mnt/sdcard/jata/favorites.db. Displays general information and some help. Sort of a condensed version of this article. Agencies that use BusTime issue “keys” for third party developers. Once a new key is obtained by jata developers, the new agency can be added to the database. Jata can check for updates from it’s Settings screen. If you know of a Transit Authority using Clever Devices (has a BusTracker web page and a “Powered by Clever Devices” logo), and want it added to Jata, please send an email with a link to the Transit Authority’s site to jata@stillwatereng.net.. We’ll try to obtain the keys, and add it. joe – Who wanted jata to be named jbus or JoeBus, or XTransit, before common sense was pounded into him. Clever Devices – Created and documented their API used to get real time info. stackoverflow, where the quality of questions and answers vary as broadly as… let’s say New England weather. Fortunately, stackoverflow answers (and questions) are voted on by users, and good results rise to the top. Also, unlike the weather, you are free to pick which solution fits your needs. Android Developers The canonical site for Android API documentation. Can be hard to interpret without the help of stackoverflow. EDUmobile Mobile Training who’s online course in Android programming helped get an Android developer up and running, and gave a brief introduction to Android programming concepts at a discount rate. ZXing Team provides an excellent Barcode Scanner application and a module to integrate it into your application. For even more about jata, go to the jata development page. Re-use those PS/2 keyboards and mouses! A person essentially lend a hand to make severely articles I might state. That is the first time I frequented your website page and to this point? I surprised with the research you made to create this actual submit incredible. Great task! NOTE From Stillwater: While this resembles many “comments” which are actually just spammers using WordPress Blogs as a vehicle to post links to their sites, which usually sell un-related products (you should see all the athletic shoe links that came in on the “Treadmill Repair” post), this guy is not actually selling anything, probably just trying to drive traffic to his site, as I am. It looks like there is some useful info at his site, I can only hope it’s original, not copied from somewhere else. Наш сайт посвящается всем вариациям дохода в Интернет-сети. Надо сразу заметить, что заработать в глобальной сети большие средства – реально. Однако, каждому пользователю добиться хорошего заработка за за один день – невозможно. Однако каждый месяц иметь дополнительный доход, сопоставимый с текущей зарплатой, вполне осуществимая задача. Самое основное в этом деле желание. Надо помнить только одно – деятельность в глобальной сети является еще одним из видов получения дополнительного заработка. Это не говорит о том, что здесь можно ничего не делать и получать деньги. Основное преимущество Интернета состоит в том, что здесь не существует различных барьеров, и возможность получать средства доступна любому. Специфических знаний и умений для заработка денег не нужно. Не обязательно знать языки программирования, либо профессионально рисовать. Самое главное, что необходимо от человека, это иметь доступ к сети Интернет и несколько часов вашего времени. На сегодняшний день Интернет имеется почти в каждом доме, и каждый легко сможет уделить пару часов для работы. Конечно, всех интересует, сколько они смогут заработать. Нет определённого ответа, поскольку все зависит от стараний человека, его амбиций много зарабатывать. Can you add the Phoenix AZ Valley Metro service to the database plase? Hi Chuck, thanks for reading. I sent an email to csr@valleymetro.org to ask for API access. Not all agencies are ready to hand out the address and the key to their Bustime API. 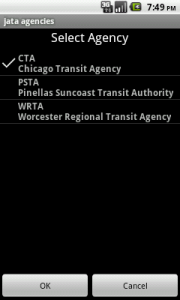 I had a bad experience with Sarasota County Area Transit, right next door to Pinellas Suncoast Transit Transit Authority in Florida. 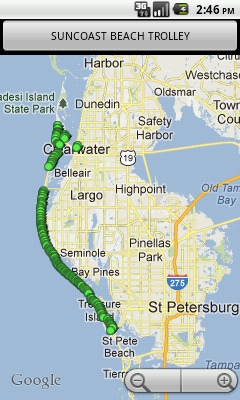 Making me wonder whether Sarasota County Area Transit cares more about their pride or their users.